Netherealm and Warner Brothers bring’s us a sequel to Injustice gods among us, Injustice 2; Does this fighting game compete as a number one contender or a chump? let’s find out. 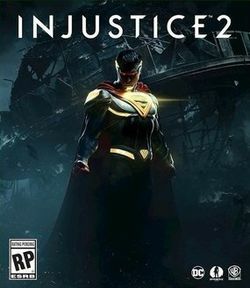 Injustice 2 takes place after the events of One still feeling the effects of Superman turning evil after the joker got to him, but this time it seems that Gorilla Grodd and Brainiac are behind the evil plans this time. Batman and the rest of the Justice League (minus Superman) team up together to take down Brainiac as he attempts to destroy the world. During the duration of the story, we see new characters come in to play like SuperGirl, Cyborg, Harley Quinn and so much more. Progressing through some of the heroes we see become overturned or brainwashed if you will and join Brainiac in his mission to destroy Earth just like he did Crypton. Sometimes in the story line, you will have a choice of two heroes you want to fight as it’s only at the end though that it makes a difference of the storyline if you choose to play as Batman or Superman. The ending is a bit different than most fighting games because we see the team divide a little bit, in the end, depending what happens to Brainiac while Batman is about bringing him to justice, Superman wants him dead. The gameplay is just like the previous one and Mortal Kombat now that is good and bad at the same time. Some of the heroes fight flat on the ground while others float in the air which well can be somewhat annoying, I get it you can fly do not really need to emphasize on it. The fighting in this game is not the greatest either the moves list is a bit lackluster when it comes to variety, and one thing that really grinds my gears about this game is I do no like having to enter the entire button combination before it will actually do the special move I just wish it could be more react quicker when I do the combo move like in Tekken or Dead or Alive. Injustice 2 is a great game, however missing some of my favorite characters DC universe, the story was short, but gave you the opportunity to play as everyone it was short and sweet. The customization in this game is deeper than any other fighting game I have played in my life and it is something I can appreciate and hope to see more of. This is your normal fighting game with a story, Arcade, Online, and Multiverse mode. I hope there is a third one with a bit more characters, better and more responsive combos.